There are various picture hanging systems available to light your wall decorations such as picture frames, paintings and other works of fine art. STAS picture hanging systems offers a range of cleverly designed (and patented) picture rail systems which can be used simultaneously for hanging and lighting of fine art. The system offers an ideal solution for home and office use, as well as galleries and museums. 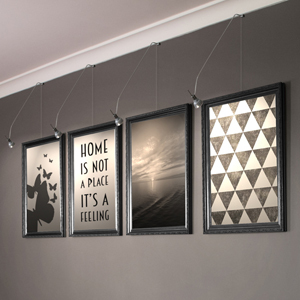 For both wall mounted and ceiling mounted picture hanging systems there’s picture rail available with 12 Volt power lines inside the track which enable you to light your pictures directly from the hanging system. 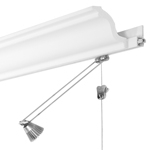 The specially designed STAS lighting fixtures can be placed directly at any desired spot in the picture rail. The STAS lighting fixtures are available in three different designs. The ‘sirius’ lighting fixture comes in two lengths (40 and 50 cm). The ‘signo’ lighting fixture is curved with a length of 70 cm. 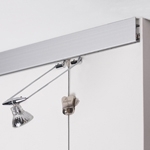 The STAS ‘classic’ lighting fixture is available in chrome as well as in white. It comes in lengths of 50 and 70 cm. You can easily plug in all STAS picture lights anywhere you like on the rail, to spotlight your wall decorations with STAS LED or halogen lamps. 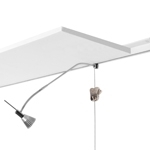 The STAS multirail system is a worldwide patented painting suspension system equipped with low voltage 12 volt wiring. 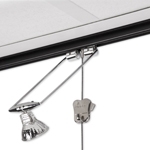 The 12 Volt power lines inside the rail enable you to light your art directly from the hanging system. The lighting fixtures can be clicked directly into the track. Therefore, by using the STAS multirail system you will get rid of sloppy cables! 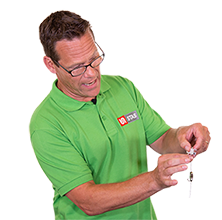 The wireless 12-Volt system is powered by an 18W, 60W or 96W adaptor. There are various LED and halogen lamps available for the STAS lighting fixtures, with different wattages, to ensure optimal art lighting! For more technical details about the picture lights, the mulitrail system and lighting your artwork, please visit the FAQ page. VL 10304 STAS Mulitrail Halogen 20W Alutech. Colour: warm white. Durability: 3000 hours. VL 10400 STAS Multirail Powerled 1.5W. Colour: cool warm white. Durability: 20.000 – 50.000 hours. This lamp provides a broad diffuse lighting pattern. The output is equivalent to a regular 10W light bulb. VL10700 STAS multirail powerled 4 watt. Colour: Warm white. Durability: 20.000 hours. Equipped with 3 LEDS and a frosted lens. The output is equivalent to a regular 20W light bulb. VL 10305 STAS Multirail Halogen 20W Alutech Frosted. Colour: warm white. Durability: 3000 hours.